WELCOME TO NATALIA speirs` MELODY MUSIC SCHOOL! 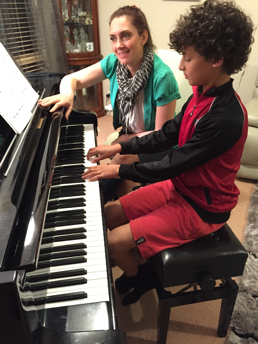 We offer high quality lessons on: PIANO, SINGING, VIOLIN, GUITAR, THEORY from fully qualified, dedicated and experienced music teachers in Melbourne. These lessons are available for all ages from 5 years to adults from beginners to advanced musicians. For those of you who decided to make a music career, we provide preparation for A.M.E.B; V.C.E exams and vocal performances. All our students pass the exams with high honours and credits. Even if you don't plan to become a professional musician, you can just come and learn for your pleasure and fun! If you are a parent, please note that for ages music lessons were considered to be essential way to develop musicality, creativity, intelligence and confidence in grown-ups. Albert Einstein, Neil Armstrong, Alexander Graham Bell, Thomas Edison, besides being great scientistics, inventors and researchers, all were very good musicians. COME TO OUR SCHOOL AND EXPLORE THE BEAUTIFUL AND AMAZING WORLD OF MUSIC!